First,press Alt+F2 and type in “update-manager -d” (without the quotes) into the command box. Update Manager should open up and tell you: New distribution release ‘9.10’ is available. Click Upgrade and follow the on-screen instructions. First,install the update-manager-core package if it is not already installed. and follow the on-screen instructions. 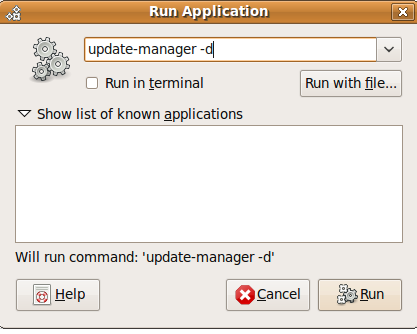 No user responded in " Upgrade ubuntu 9.04(Jaunty) to ubuntu 9.10(Karmic) using update manager "